Athens, Greece ft. the acropolis. I have been in Athens, Greece for over three months now and wow - time flies (…most days!). I settled in pretty quickly, enjoying everything that Athens has to offer. My housing and club situation is great and my surroundings have vastly improved from last year. I am living across the hall from Canadian National teammate, Marisa Field, our neighbourhood is bustling with cute cafes and bars, and the city center is only fifteen minutes away. The weather has started to take a turn, but especially during the first month of preseason I had to continually remind myself that I am working here and not on a permanent vacation! The sunshine made it hard to focus. Taking little day trips around the city and heading to the beach clubs with Reese and Justin (Duff [men’s National Team] – who is playing across the city for Olympiacos this season) on our days off, plus a couple of the German girls to make it a crew. Reese and Britt Page are usually whom I end up going on wonderful European adventures with, and my last one was actually to Greece with the two of them this past spring. I had just spent two weeks in Switzerland with Rudy while he finished up his (second) season and on a whim, I booked my flights to join the girls in Greece to explore Athens, Crete, and Santorini. That’s actually how I ended up playing here. While in Athens I met my club’s coach, assistant coach, and manager. They were meeting up with Marisa to discuss this year (she had already signed) and after Britt and I went for our own dinner, we had a drink with them. So what started out as one of Reese’s “master plans”, turned out that things started progressing quickly, and before I knew it I had signed to play here. So here I am! One of the pre-season tournaments that we won! Foreigners enjoying some beach time! This is my first year doing European preseason as we usually join our new teams in September or October after National team commitments. Preseason was long. And tiring. We had weeks of friendly matches leading up to regular season with no breaks, but our team worked hard and won both tournaments we played in. We have currently only lost one match this season (vs. Olympiacos… but really we won… stay tuned for THAT post) but are still leading the league. My club, Panathinaikos, has goals for this season to rebuild the team and program. We have finished in the top 3 for many years in a row but haven’t won the championship or cup title in recent years, despite having an impressive history. Even though we’ve had some success early on in our season, we are continuing to work hard because we haven’t even come close to our potential (in my opinion). I am really excited to see what we can accomplish this season. 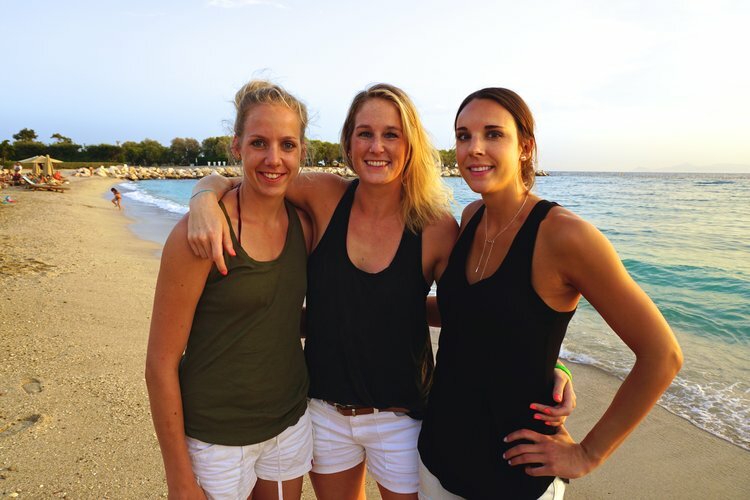 My Greek teammates are lovely, and playing alongside Reese and a German outside hitter, Jana, is so great. The club has big dreams for us but I think the players do too. Not surprisingly, more people have been saying they want to come visit this season. Lucy Charuk is currently playing in Bucharest, Romania and during one of her free weekends at the beginning of season, jetted down here for a quick hangout. TJ Saunders is in Izmir, Turkey, which is only an hour flight (or boat) away so hopefully we can have a Canadian reunion soon. My dad just spent the past 3 weeks here, roaming and exploring Athens. Although, I never did let him drive my car; Roberts Creek and Athens traffic patterns are slightly different. It is definitely so nice when loved ones and friends come to visit in the place you call home for eight months. Not only is it so refreshing to have them around each day with someone to come home to, there is also something special about showing off “your world”. The holidays (Thanksgiving and Christmas) are usually the hardest time to be away, missing all the fall festivities and other such events. And even though I make sure to stay in close contact with everyone, it is still difficult. Throughout the entire season, it’s necessary for me to have little check-ins with myself to see where I’m at. I am here and called to play volleyball everyday. I am in the gym working hard with National Team on my mind and trying to improve my skills each day and each week. In order to have success, I need to stay intrinsically motivated (something our skypleship group has discussed a lot this past month) in order to not find my self worth in performance. It’s so important for me as an athlete and a player to find little joys outside of practice that will help fuel me as an individual, and ultimately help me perform and be a better teammate. I have connected with a church at the beginning of my time here and finding some wonderful people outside of volleyball has been very refreshing. Playing overseas is an ever-changing process that includes multiple self check-ins, and even though this is my fifth year abroad, I am still consistently learning new things about the world and about myself. Overall, it’s still hard being away from home, friends, and family. However I am excited about the opportunities that this year will bring me, on and off the court. It has been an interesting transition back to playing after taking the summer off. I am continuing to stay patient with myself as I get back into the groove of playing, and ultimately back to my level of play where I left off. Not every day is a walk in the park, and sometimes, things are still difficult and a bit frustrating. But I have a sense of peace and excitement about this season that I haven’t had before. There isn’t a better feeling than knowing you are suppose to be right where you are. I will continue to seek out the little joys that come with each day and see where that takes me this season! A different version of this article can be found on the VolleyVerse website here.